The risk of transfusion reactions prevented widespread use of blood transfusion till the turn of the 20th centaury. In 1900 Karl Landsteiner while mixing red cells and serum from his colleagues discovered that the serum of some individuals reacted against the red cells of other individuals. Based on reactions between sera and red cells he described three blood groups, A, B and C (which was later renamed as O). The fourth group of the ABO system, AB, was described a year later. In 1907 Ruben Ottenberg and Schultz suggested that before transfusion both the donor and the recipient be grouped and the blood mixed in the laboratory to ensure compatibility. Using this process Ottenberg virtually eliminated transfusion reaction. Landsterner and Weiner discovered the Rh Group in 1940. The use of blood grouping (ABO and Rh) and cross-matching has made blood transfusion safe. Antigens of the ABO system are polysaccharides. They are produced by the interaction of genes at two loci, 19q13.2 and 9q34.1 in two steps. The first step involves addition to a precursor of fucose in a α1-2 linkage to a precursor by the action of FUT1 a fucosyltransferase synthesized by the gene encoding for the H antigen located at 19q13.2. The second step is addition of N-acetylgalactosamine or galactose by glycosyltransferases encoded by the genes for A and B group antigens respectively. These genes are located at 9q34.1. The phenotypes resulting from the action of the two genes are listed in table 1. About 200 alleles ABO genes have been described. Qualitative and quantitative differences between glycosyltransferases encoded by these gene produces a spectrum of antigenicities on the red cell. Quantitative Differences in ABH Genes: Quantative differences exist in both A and B group antigens. A1, A2, A3, Ax, Am, Ael are subtypes of A with progressively decreasing Aantigen sites. It has been estimates that A1, which is the commonest A subtype has 800,000 antigenic sites per erythrocyte, A2 has 250,000 sites and Am has only 800 sites. B1 is the most common type of B antigen. Weaker B antigens include B3, Bx, Bel. Individuals with a weak type of antigen can produce antibodies against a strong subtype of the same antigen. Patients with A2 can produce antibody against A1. The Cis-AB Group: A rare and interesting type of blood group is cis–AB. Usually individuals with AB have a gene for glycosyltransferase for A group on one chromosome and that for B on the other chromosome. They inherit one gene from each parent. Cases of AB children born to AB group mothers and O group fathers can only be explained if both the A glycsyltransferase and B glucosyltrasnferase activity is carried by the samegene. This is known as cis-AB. Apart from raising paternity disputes cis-AB can also complicate transfusion. The common types of cis-AB express a weak B (B3) and can have anti-B antibodies making only washed O or A cells suitable for transfusion to these patients (Br J Anaesthe 1999; 83:491-2). 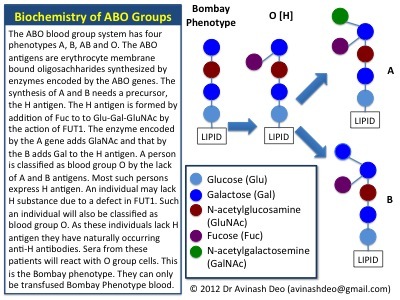 The Bombay Phenotype (figure 1 and 2): Blood grouping involves mixing patients cells with anti-A and anti-B sera. Group A cells agglutinate with anti-A, group B with anti-B and group AB with both. If no agglutination is seen the blood group is designated as O. The H antigen is a precursor to A and B antigens. Patients who have blood group O have inactive glycoryltransferases and nothing is added to H. H is the group O antigen. Rarely the gene for FUT1 mutated (h) resulting in an inactive product. These individuals do not synthesize H antigen and will not synthesize A or B antigens even if they have genes for the respective glycoryltransferases on chromosome 9q34.1. Their red cells will neither agglutinate with anti-A nor with anti-B sera and will be grouped blood group O. As they lack H they have agglutinating naturally occurring anti-H antibodies. When serum from these patients is mixed with cells from O group individuals the anti-H antibodies in their serum agglutinate O group cells. These individuals are group O on forward matching but not on cross-matching. This is known as the Bombay phenotype. Such individuals can only be transfused red cells from individuals of Bombay phenotype. Groups A and B are synthesized from H antigen. Bacterial glycosidases can be used to lyse GalNAc and Gal convert A and B group antigens to group O. O blood cells can be given to any individual (except Bombay phenotype). This technology when available for clinical use has the potential to eliminate blood shortages. The ABO antigens are polysaccharide antigens capable of stimulating T independent B cell responses. Unlike other blood group antigens like the Rh, the serum contains naturally occurring antibodies to the antigens of the ABO and other polysaccharide (Le, Ii and P) blood group systems that are believed to be produced following exposure to environmental antigens like bacteria (J Clin Invest. 1969 July; 48(7): 1280–1291). The antibodies belong to the IgM class and are agglutinating, bind C3. They can cause haemolytic disease of the newborn but the presentations are uncommon and mild. Physiological Role, Variations and Disease AssociationsThe physiological role of ABO antigens in not known. A relationship between falciparum malaria and ABO antigens has been proposed. Malaria infected cells express a protein PfEMP-1 a protein that can bind to A (and B) on the endothelium. Plasmodium infected cells are less likely to adhere to endothelium of group O individuals reducing the severity of malaria in these individuals (Blood 2007; 110:2250-2258). The levels of von Willebrand Factor and factor VIII vary with blood group. They are highest in blood group AB and lowest in blood group O. Group O individuals are at risk of bleeding and AB at the risk of thrombosis. About 30% of the variation in vWF can be explained by ABO blood groups. vWF expresses A and/or B antigens and these may be responsible for conferring vWF resistance to degradation by ADAMTS13 resulting in higher vWF levels. Group O individuals have a lower risk of squamous and basal cell cancer of the skin, pancreatic cancer and gastric cancer. Individuals expressing B antigen are at a higher risk of ovarian cancer and group A individuals are at a higher risk of gastric cancer. Peptic ulcer is more common in O group individuals. Nice article. Easy to understand. Thanks for posting.